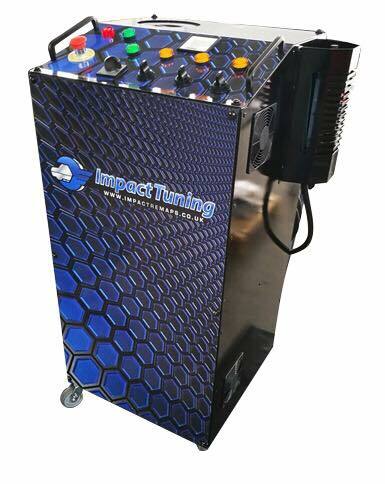 Impact Carbon Clean decarbonising and engine cleaning system is now available. Over time carbon deposits accumulate in engines leading to a wide range of problems including loss of power, higher fuel consumption and increased damage to engine parts. Impact carbon clean machine runs on just tap water, meaning there are no harsh chemicals or expensive additives. Instead, electrolysis produces highly charged oxygen and hydrogen molecules; the oxyhydrogen (HHO) gas mixture is then cooled and filtered before it’s fed into the engine through the air filter. Once inside the engine, increased oxygen improves combustion whilst the catalytic properties of hydrogen get to work so that carbon deposits are broken down and burnt away. The treatment takes just half an hour, and the machine is fully automated so technicians can work on the vehicle whilst the process is running. Impact Carbon Clean Centres gain access to a comprehensive business package that includes equipment, training and technical support. There’s marketing help as well as support for users carrying out Impact carbon clean services, through a network of UK engineers. Garages have the peace of mind of offering a true ‘green’ solution that uses only water and electricity in cutting emissions and fuel consumption. How would you like your garage to bring in an extra £28,512 profit a year? That’s what carrying out just one 30 minute Carbon Clean service a day will bring in over a year – all profit! Carry out two or three services a day and the profit adds up quickly. What makes our ICC230 machines the premium option for the business owner looking to make maximum off-ramp profit? ⚫Our service is proven to improve a vehicle's performance, economy and emissions.